A luscious assortment of strawberries, blackberries, and raspberries, in a grapevine basket accented with flowers and French ribbon. We specialize in strawberry gift baskets, chocolate strawberry baskets, and gourmet strawberry gifts which include strawberries in chocolate, strawberries with dipping sauce, and gourmet chocolate and strawberries. 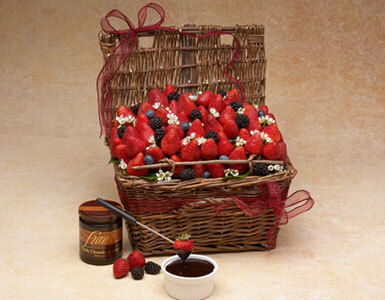 We offer these baskets only when the finest berries are in season. These delicate arrangements of chocolate strawberry gifts and chocolate strawberry baskets must be delivered by hand and are only available for delivery in Beverly Hills, West Hollywood, Santa Monica, and the greater Los Angeles area.